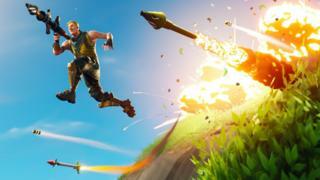 A joke tweet about the gaming craze Fortnite from a Scottish island library has become a social media hit. Orkney Library already has a big following for its off-the-wall use of Twitter. The latest thread started by saying children kept asking for books about Fortnite, but staff had never heard of it so asked what it was. However, the punch line at the end of the five-tweet thread has now had more than 30,000 likes. Fortnite is a hugely popular game that can be played on most devices, including mobile phones, tablets and consoles. Orkney Library's first Fortnite tweet was on Monday, explaining a lack of knowledge about the subject. The library said a man came in to borrow some books by the author Lee Child and he had his son with him. It said Fortnite on the boy's top. The thread continued that while dad looked through the Lee Child books - he was re-reading the series - they asked the boy to explain Fortnite. They found out it had millions of players worldwide. "The only boy who could ever teach me, was the son of a Reacher fan." The unexpected punch line - referring to Lee Child's action character Jack Reacher and the lyric of Dusty Springfield's song Son of a Preacher Man - won over Twitter. On Tuesday, the library tweeted: "Okay that's enough now. The notifications from yesterday's thread have gone off the scale." Okay that's enough now. The notifications from yesterday's thread have gone off the scale. By far our biggest tweet so far.